Summertime is the stuff dreams are made of! Time off from school and work lends precious time to make memories with friends and loved ones. When the weather is nice, one of the first spots most people want to visit is a body of water, be it the beach, lake or river. As nice as the refreshing waters are on a hot summer day, a trip to the beach or lake isn't without its messes. Tracking sand, gravel, dirt or other elements into your car can leave you with a big headache. Check out our top tips for keeping sand out of your car this summer. 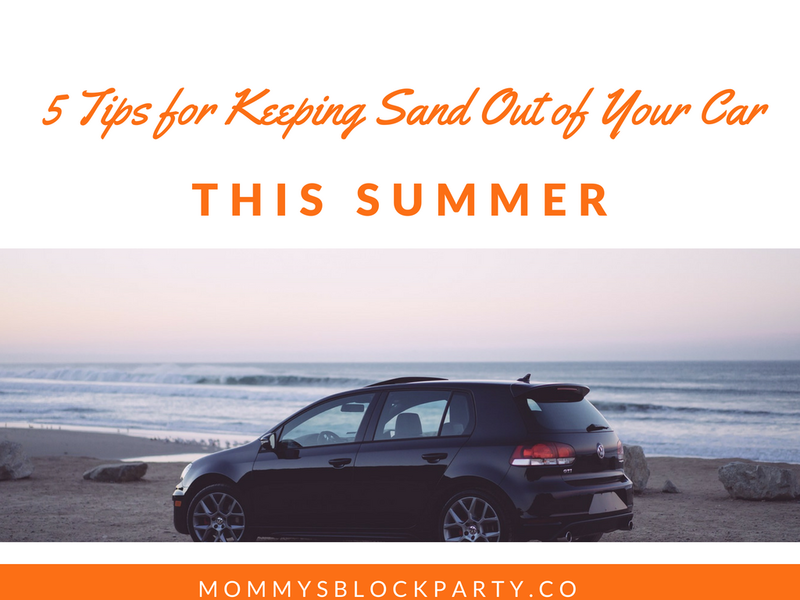 This one is tough if you have kids, but one of the best ways to keep sand out of your car is to avoid full-on contact with the sand. Your kids will probably want to sit in the sand and dig a big hole, then proceed to bury one another. While this is fun for them, it creates a problem for you if you have to put them back into the car without a way to shower them off beforehand. Encourage them to sit on beach towels or in a beach chair, if at all possible, so they can avoid having their bathing suits become sand traps. Ever feel like you're dragging the whole world onto the beach for a day of fun in the sun? Chairs, coolers, sand toys, beach bags- all of these items are major sand collectors. Keep sand toys in a mesh bag, which can be dipped into the water and be rinsed off, all together, instead of one by one, which is very time-consuming. Dip coolers and the bottoms of beach chairs into the water to clean them off, as well. Just keep in mind that metal objects should be rinsed with fresh water at a later time to prevent them from rusting from the salt water. Play a fun little game with family and friends before getting back into your car after a day in the sand. Have everyone do a little shake to get any excess sand off of their clothing. Extra brownie points if you can come up with your own song and dance to encourage little ones to shake the sand away! Have your kids sit on the edge of their car seat or in the trunk (if you have a hatch), and sprinkle baby powder over sand areas of skin. Lightly brush the powder and sand away with your hands. The powder will help loosen any stuck on sand and keep it from getting into the car. This is especially handy to use on legs and sandy feet. One my family's last beach trip, we purchased a seat cover for the back seat of our SUV. It was really meant to be a pet seat cover, but we figured it would work well to keep sand out of the seats. Not only did it keep sand off the seats, but since it was a waterproof cover, the kids could climb right in, even if their suits were still a bit wet or damp. We lined the floors and the trunk with clear plastic shower curtains, which were purchased at a $1.00 store. It worked well to keep the sand off of the floors, and to keep it from getting all over the trunk. We shook them out all week long during our trip, and then just tossed them afterward. It was $2.00 well-spent! What are your tips for keeping sand and dirt out of the car after a day of fun in the sun?